A Nature Trail was organized by WWF MSO, India to Mahuli. Mahuli is a fort, the highest point in Thane district at 2815 feet. The forest surrounding Mahuli Fort has been declared as a sanctuary – Tansa Wildlife Sanctuary. The place is dominated by semi deciduous forests, and gives a different picture in wet and dry seasons. It is near Asangaon – a station on the Central Railway line, which easily connects Asangaon to Mahuli. The State transport bus service is an economic way to reach the Mahuli Gaon (from Asangaon), but there are auto-rickshaws that might take you there too. However, having own vehicle will save a lot of effort. The climb to the fort is considered tough and tougher during wet season. But it is a favorite destination for serious trekkers. It is also flocked by picnickers during monsoon to enjoy the abundance of free water in the shape of streams, rivers and waterfalls. Last but not the least, it is a favorite sought after destination for nature enthusiasts whether the season is dry or wet. Mahuli is still a less known place amongst the masses, and I’m glad it is. The tourism has not taken a serious shape here, if you compare it with Matheran. But signs of destruction are yet everywhere, and that sign is plastic. On my short trail at the base of the Fort, I came across heaps of garbage. In fact there was more plastic than any insect at certain places. This can be due to excess tourists visiting this place to enjoy the result of monsoon, but it is serious. There is a temple at the beginning of the climb to the waterfall, with all the four sides of its walls covered in plastic. One reason for this – school children who come for picnic, who are unaware of their habit, throw plastic bags outside. This needs to change. Second reason – people who feel bored or dirty of carrying plastic with them prefer to throw it, for example – I saw people eating food and throwing the plastic that once carried their dabbas into the river! Third reason – no one picks it up. If you do not belong to the first two reasoning types, you certainly belong to the third. Let us be more humane, and add a fourth dimension to protect nature – a reason to practice what we learn – to pick up that plastic littering the forest floor. I heard people complaining of that littered forest, how bad it look, how bad people can be and so on, but none made an effort to bend and lift that plastic. This is what needs to be changed. We are good people we do not litter, but we are not better than them either. I did a little effort of picking up plastic and shoving it in my bag, but that effort was negligible. If many hands do it, imagine how nice the forests will look. The vegetation of Mahuli is beautiful and hides a lot of fauna in her cover. There were so many moths, butterflies and beetles that I failed to capture each and every one of them. Yet I came home satisfied with what I sighted, although it was not the best of the sightings one expects from Mahuli. We were very short of time, and were delayed by unforeseen glitches – no ST buses, not enough rickshaws, etc. Yet in these couple of hours, I felt fresh as a flower, strong as a tree, and learned as everyone else. This is a small report of the sightings Mahuli offered me, and I offered her my little help. I yearn to return to her again! 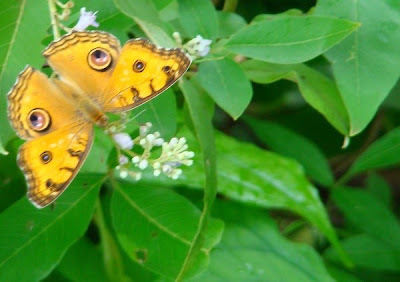 Leea indica - A small tree that blooms during Monsoon, also attracts many butterflies. We saw more than 20 butterflies on a single tree feeding on it's flowers. It was a sight to watch! It is, as it is clear, a strong butterfly attractant, but other insects such as Beetles and Weevils, Bees and flies and spiders that come to prey on these are commonly seen on Leea. Cleome sp. - These tiny flowers dot the forestfloor and give it a refreshing feel. They are commonly seen during Monsoon, in forest clearings. The herb is very small, hardly measuring 10 cm. Jasmine: Jasminum malabaricum - A Jasmine smells as nice as it sounds. It is one of my favourite flowers (the name of the plant even!). Jasmine was also in bloom along the road. Breynia retusa - A beautiful plant, the flowers and seeds of which resemble Cup-and-saucer, hence the common name also. It is the most commonest sight during Monsoon at SGNP, Yeoor and other places. The above image is of an interestingly dead plant. The brown support is actually a dried fruit, on which the seeds have probably sprouted. After a few days, this dried support will fall off and give the seeds to rise up through the earth. It is so fascinating to see the mother plant, still caring for her plant-lings, even after death! Being on the parent plant itself provides these sprouts enough sunlight than might reach the ground. Not only that, but they will not have to compete with other plants until they are tall enough. Up there - on the mother plant - they get water through rain and nourishment from their mother. That's a strategy to compete in the world of plants! A snail seen crossing a strong current of water in a stream. Camponotus sp.? - There were many ants including Major as well as Minor workers tending to some "Hemipteran" nymphs, probably that of Hoppers. One small nymph is seen just near the mouth of the topmost, up-side-down ant. Many Hoppers excrete excess sugar from the body, which is loved by Ants, and thus get protection from the ants. Leaf Beetles - A pair of these were seen hiding behind the leaves. Many moth caterpillars were seen all over Lea and Teak. This peculiar pose of the caterpillar is a "threatning" display. They raise their head and rock it, and regurgigate the eaten material. Its a gross sight, so many predators would possibly keep away! Another interesting sight was a moth caterpillar making a cocoon. Many moth families make cocoon, before transforming into a pupa. It is woven around in silk, keeping enough room for the caterpillar to transform inside it's new home, safely. On a contrary, butterfly caterpillars do not make a cocoon. 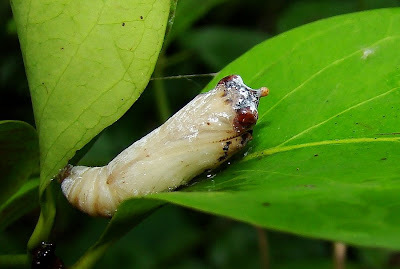 They directly transform into a "naked" pupa, as seen in the above picture. However, this pupa never survived - the milky white patch on the pale pupa is fungus. Phazaca sp. - A moth belonging to Uraniidae, the family of Uranid moths. 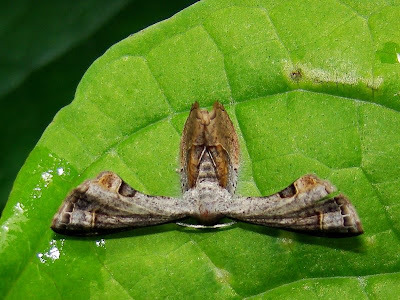 Parasa herbifera - A small moth that would possibly go unnoticed, was resting on a wall. It belongs to Limacodidae, the family known for its "nettle" caterpillars. Bright Babul Blue: Azanus ubaldus - A small Lycaenid, only one specimen was seen feeding on Vitex flowers. Plum Judy: Abisara echerius - The only species belonging to Riodinidae is seen in-and-around Mumbai. It is a beautiful butterfly with plum and purple colours. The above and below photographs are of the same male specimen. Pioneer: Belenois aurota - Also called Caper White, I had always wanted to photograph it. Identified easily by it's "hockey" shaped mark on the forewing, bordering the outer margin of the cell (just above the head, in the picture), it is not as common as Common Gull. Chocolate Pansy: Junonia iphita - A common pansy, here it was sitting on my pant, absorbing the salts - a good sign that I must wash my pant. Image below shows it's proboscis in action. The bent tube in front of it's leg is the probiscis. It was extracting the salts so eagerly, that it didnt mind my camera just beside it! Lemon Pansy: Junonia lemonias - A pretty and common Pansy, it was seen feeding on Leea and Vitex. Whats unual or not hardly observed is shown in the photograph below. 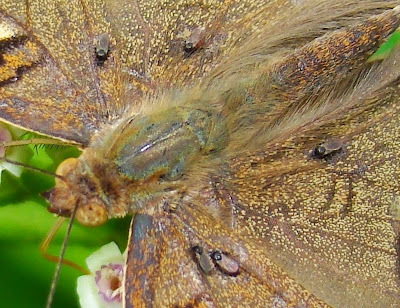 The above picture is a tight crop of Lemon Pansy, showing "flies" resting on it. I took several pictures of this pansy over a period of 5 mins, and these flies seemed to have "settled", in the sense, they were not flying around it. They were probably only saving their energy and riding on a butterfly - or they were parasitic? No idea. 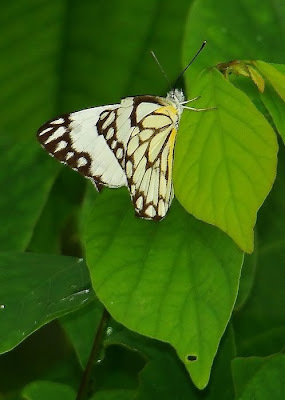 Common Leopard: Phalanta phalanta - It is a beautiful brightly coloured nymphalid, it was the commonest one seen at Mahuli. Even P. phalanta were seen puddling on sweat and cowdung. They were seen feeding on Vitex and Leea also. Peacock Pansy: Junonida almana - A beautiful nymphalid but not so beautifully captured. I managed this horrid record of Peacock Pansy feeding on Vitex. A beautiful butterfly! Great Eggfly: Hypolimnas bolina - Another nymphalid, it was resting nicely on a rock just beside the road. It was the eyes of curious nature enthusiasts who saw it. 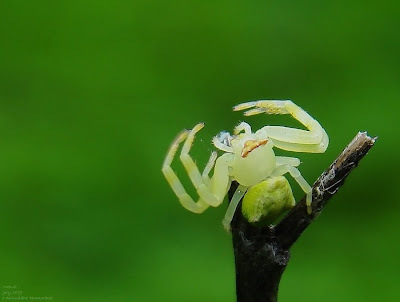 Thanks to them :) Crab Spider - A tiny Crab Spider was sitting on a bare branch. Perhaps lost, it was looking worried and not so happy by my presence. Crab Spiders are known for their camouflage and will prefer flowers to dissolve into the environment. This fellow was probably blown away by the wind and managed to crashland on this dry twig. Tiny spiders are light enough to glide in the wind. By releasing a long strand of silk in the wind, they easily get carried away by its force but land at undetermined places. This sort of transport is seen in tiny spiderlings. Perhaps it is used by Crab Spiders too? Lynx Spider - A very common spider throughtout the year, here it is seen guarding it's eggsac. Harvestman - A common occurance during Monsoon, also commonly called "Daddy Long Legs" and also commonly confused to "Daddy Long Legs spider" of Pholcidae. Some species are considered as a good indicator of a healthy habitat, while many are present in disturbed ones. 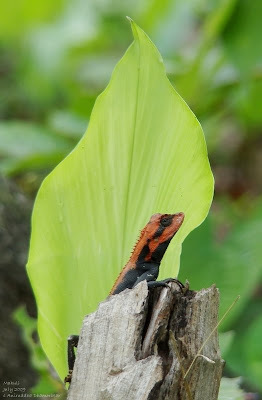 Forest Calotes: Calotes rouxii - Commonest reptile occuring around Mumbai, the male's often pose nicely and are a good subject to learn photography. 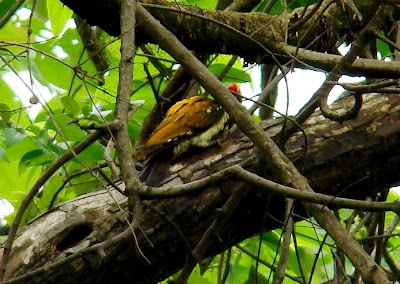 Flameback Woodpecker - A Record shot of a Flameback. The above image is that of the fort. Fantastic secenery. On the way to Mahuli Fort, through Mahuli Village. Last but not the least, the last stop for all vehicles. Source of many things. Nice Blog and nice Pics..! !